The NRS Split Bow Bag is a long and narrow float bag that fits on either side of a kayak's center support pillar. Bow bags fit forward of the foot area on most kayaks longer than 8'. The bow bag is made with a 10-gauge urethane fabric that won't leak or delaminate. It features a 38" inflation tube and has a D-ring at the top for easy securing. Perfect fit! I bought a pair of these for my Dagger Axis 10.5, they fit up front of the bow support and once inflated are locked in never to be concerned with again! Thanks to ACK for recommending these bags for me. I bought this product for my Pungo 120 and Pungo 100 after a friend capsized at a sharp turn in the river with a tree partially blocking passage. Her Kayak didn't have float bags & was very difficult to recover. My Pungo's have bulkheads for the stern but not the bow so I've added these to improve bouyancy of the kayak in the same type of problem. These bags are tough and fit very well in bow of both Pungo's. They are tied off in the boat to the front handle of my kayak through a small hole I drilled. This way, I don't have to worry about them popping out. Excellent fit in my XP10 and what a difference for bailing out the water. GREAT product, pricing and quick shipping. Excellent product. Installed in two Dagger Approach 10.0s. Stayed inflated throughout the summer. Inflation tube fits nicely in gap between cockpit rim and thigh pads. 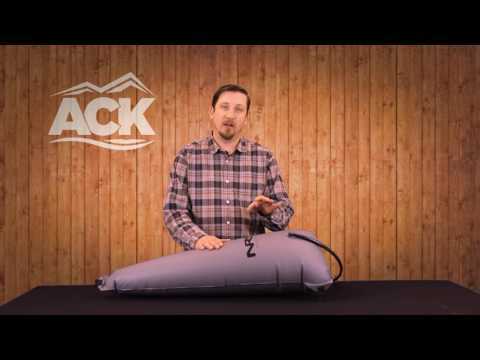 Strong, easily inflatable product that fits snugly in place. A good item from a fine mail order retailer. Does exactly what it is supposed to do - float my boat. "Tested" three times at the Yough this weekend in my playboat, and worked great. The NRS Split Bow Bag fits well, easy to inflate, does a good job. Perfect fit for the stern of playboats like my EZG50!!! Great price. Just trim the inflation tubes down of excess length, cut out the valve and stick it back in the shortened tube, no glue, no leaks, been full of air for a month or more so far!